In the land of the blind, the one-eyed man is king. 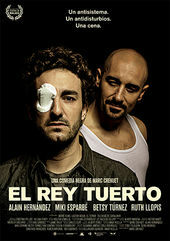 In Marc Crehuet’s 2016 dark comedy El Rey Tuerto (also known as El rei borni), a demonstrator loses his eye to a rubber bullet shot during a rally. Soon thereafter he finds himself a guest in the home of the police officer who shot it. Face to face at a couples’ dinner, the men must confront each other and their convictions, trapped in the context of a cordial social gathering. Designer Pablo Sánchez’s opening title sequence to the film takes this conflict and its explosive catalyst – the rubber ball – and focuses on it with unwavering style. The colours flash on and off, a minimalist palette of red, white, beige, and black echo blood and skin and rubber and change in time with the pounding beat. The circle at the centre starts small but grows steadily, larger with each drumbeat, a pinprick, a ball, an eye, a hole, a sun. The drawings of police vehicles and cutlery drop away as the dark circle swallows the whole and the stage is set for a bold confrontation.